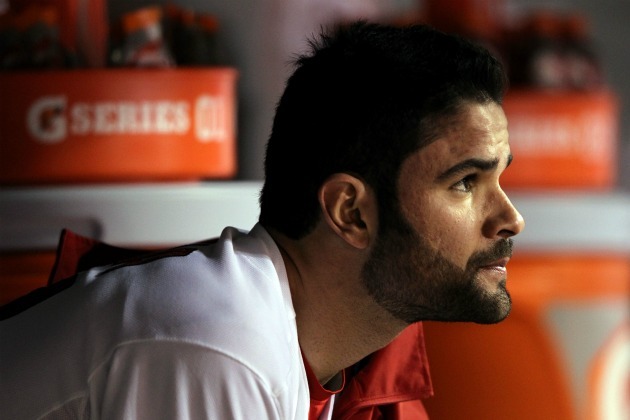 UCB Roundtable: What should the Cardinals do with Jaime Garcia for the 2015 season? St. Louis Cardinals starting pitcher Jaime Garcia has been sort of an enigma that last couple years. The two-time 13-game winner has dealt with a shoulder injury on several instances dating back to the 2012 season. The apex of this saga arguably came in 2012 when Garcia attempted to pitch Game 2 of the National League Division Series while knowingly hurt. The result was two innings of tight-rope walking pitching that nearly resulted in an important loss for the Cardinals, a performance that caused some teammates to publicly disclose their frustration with Garcia. He made nine starts in 2013 and went 5-2 with a 3.58 ERA in 55.1 innings pitched, but again was sidelined by injury. He made a similar comeback in 2014 and showed flashes of what he can be when he’s right, but his season ended after just seven starts as his shoulder woes came back. He went 3-1 with a 4.12 ERA in 43.2 innings pitched. For context, Garcia logged 479.2 innings from 2010-2012 and won 33 games during that stretch with a respectable ERA of 3.36. In 2013 and 2014 combined, Garcia logged just 99 total innings and saw his home run rate skyrocket. He gave up six home runs in 2013 and 2014 in just 16 total starts. He gave up seven home runs in all of 2012. The Cardinals are getting close to a crossroads with Garcia where a decision must be made on his future with the organization. The 28 year old is under contract through 2015 and is due $9.25 million next year, with club options for 2016 and 2017. In all likelihood, the Cardinals will have no choice but to start 2015 with him on the roster. So what do you do with him? Do you try to put him in a rotation that already includes Adam Wainwright, Lance Lynn, Michael Wacha, John Lackey and Shelby Miller? With healthy guys like Carlos Martinez and Marco Gonzales also vying for spots, it doesn’t appear that there’s a spot for Garcia there. So does he go to the bullpen? Should the Cardinals try to trade him? For this installment of the United Cardinal Bloggers Roundtable, I posed this question to my fellow UCB bloggers. Here are there answers. To me, the Cards have to prove that he’s healthy or they may as well just release him. If he’s not healthy, or if you don’t prove he is, he’s worthless on the trade front. It would not shock me if they cut ties at some point but I could see his path being: Spring Training – Extended Spring Training – Minor League Rehab Assignment – Starting Rotation in St. Louis. At that point, Mozeliak may look to move him if he can get something in return. Jaime Garcia is such an intriguing story this season. What do you do with a guy who has proven to be a very good pitcher when healthy? If he stays in Cardinal Red, he has to be in the rotation. His should injuries weren’t from wear and tear. His arm and shoulder have gone through a deep clean and appear to be sound. I can’t imagine putting him in the bullpen. He’s never been a useful piece down there or spent a lot of time there. Unlike Marco Gonzales, Michael Wacha and Carlos Martinez, the clock is ticking on Garcia and you have to get the most out of him while you can. Best case scenario is finding a suitable trade partner for him this winter. We all know his history. He starts out great and goes bad. Second best is having him a lights out first half and then you deal him at the deadline and Marco then. I don’t think Jaime is finished in the Major Leagues but my patience with him is running on empty. It’s not necessarily his fault that his body is brittle but the routes he has taken (pitching hurt in the playoffs, not telling Mo about the surgery) and his mental makeup on a mound give me serious pause. If he’s here, he has to be a starter in order to get his trade value up. Bill’s right. The Cards have little option but to see what they have in Garcia. Nobody is going to trade for him in this state and given that his contract is up at the end of the season, it seems unlikely anyone is going to give up much for him for part of a year even if he is. While the Cardinals could waive him, they would be on the hook for $9.25 million, which is a pretty hefty chunk of change to pay someone not to play for you. While the two option years are not going to be picked up, it seems pretty likely in my mind that he’ll be a Card all year long. That said, how do you use him? I figure he gets a good long time in rehab/extended spring training, but if he’s healthy, he’s worth putting in the rotation. How you do that, I don’t know, since you wouldn’t necessarily want to trade any of your starters to find a place for a guy that might break down again as soon as you do, but I can’t see him a good bullpen piece. If he’s healthy, they’ll find a way to put him into the rotation but at this point, he seems like a lost cause. I’m rooting for his health but it feels like he misses of season after season right now. With so many season-ending injuries, I don’t know how much more the Cardinals wills tolerate. At worst, he gets DFA’d if the club can’t find a willing trade partner. I’ve just got a bad feeling that he gets re-injured once more. Hate to say it but we won’t be seeing much of Garcia this season. I joked when we did the rotation question that I’d release him only to see him win 20 games for another team…Joking aside, I’d turn spring training into an open audition for other teams. We’re full in the rotation, especially when Wacha rejoins it, whether that’s from the beginning of the year or a little later, and I think shoehorning him into the rotation will only end up with him on the DL, given his history. Plus I’d rather see what the kids have. I’d seriously consider eating his salary. This isn’t something I do lightly, but if no trade market develops for him, I’m not someone who feels a veteran *has* to play.Now, maybe he has an amazing spring training, comes into the year fully healthy. Then I’d give him a month, if he stays healthy then that’s actually the best time to trade him, as he’d have built up value. Sorry, but I just don’t trust the guy with his injury history, plus we’ve proven we can win without him. If he’s healthy, they are going to have to use him, and he doesn’t fit in the bullpen. My suggestion would be to use him as a 6th starter to plug in when a starter needs a break. They need to limit Wainwright’s and Wacha’s innings, so use him to spell both of them and occasionally one of the others when needed. He isn’t likely to have the stamina to be a full time starter anyway, because he breaks down easily. He is in the last guaranteed year of his contract, and with his health issues and his contract, he is not likely to be trade material. If he goes down again, not a big loss, but use him when and while you can for starter relief. No matter what happens with him, the Cardinals are going to have to pay at least the majority of the $9.25 million he’s owed. Even if they can find a trade partner, they’re going to not get much back for him and likely ship him off with half of his salary or more in tow.If that’s the frame of mind that the Cardinals have, I don’t know that he ends up making his way to St. Louis. He can spend time at Extended Spring, and then a rehab. If nobody takes him by the time the rehab clock is over and nobody is injured (either him or someone else in the rotation), then a release might be in order because he’s not going to come up and be in the bullpen. I really hope that they find a way to get rid of him. I don’t mean it to sound that harsh, but it’s getting to the point where it’s hard to remember the time when he was fully healthy for an extended period of time. So long, old friend. Two words here. Chris Carpenter. OK, so the mental toughness quotients of the two may be a bit different, but my point still stands with respect to injuries. Bill is exactly right that the Cardinals are going to have to prove that Garcia is healthy if they stand any chance at all of trading him for anything of value. The irony is that if he is, in fact, healthy, it is in the Cardinals best interesting to have him in the rotation and breaking up all the hard throwing right handers.I go back to our discussion yesterday – I fail to see how John Lackey offers anything above what Garcia is capable of sans injury trouble. Lackey’s contract is favorable to the team, but Garcia’s is as well already being factored into the salary planning for next year.Garcia is not a shoppable asset at the moment, Lackey is. I’d rather see the front office move the veteran right hander and give Garcia another shot at the rotation in spring. Where I differ a bit from Bill is that I don’t want to see the Cardinals play games with him, dangling him while trying to show something in an extended spring training. I know he made Mo angry with the way that he handled his injury last year, but when a team starts penalizing a player for being injured, it is time for them to start reevaluating their priorities. And there is an unwritten rule in baseball – a starter never loses his job because of an injury. If he can’t come back from the injury, that is a different situation. Garcia has earned the right to get his spot in the rotation back until such time as he shows he can’t keep it. Trade him — hope to get a second-tier rospect or a utility player — or offer him a job on the team’s Cardinal Care community relations team, perhaps a replacement for former player Ted Savage. Follow Cole Claybourn @HighSock_Sunday or reach him by email at highsocksunday@gmail.com.